Fourth-year Humboldt coach Logan Wyrick had two important conversations that have shaped Class 2A’s top scoring offense in 2018. Since the end of last season, Wyrick had considered a change at quarterback. Kyler Allen had played the position the past two falls. Wyrick said Allen was “thrown to the fire” out of necessity. Last year, Allen helped the Cubs to a 7-3 mark. Humboldt averaged 31.8 points per contest. Allen had completed 23 of 47 passes for 450 yards with a 5/3 TD/INT ratio. He rushed 26 times for 185 yards and three TDs. Humboldt averaged 7.1 yards per pass and 6.6 yards per rush. “Really wasn’t ever supposed to be a starting quarterback and had to start multiple games for us both years,” Wyrick said. Wyrick spoke with Allen and senior Dagen Goodner, a two-time all-state linebacker and a quality centerfielder in baseball with a good arm. Goodner is a three-time captain and had previously played fullback. Wyrick switched Goodner to quarterback and put Allen in the slot. “I think a lot of people kind of looked at us almost like we were crazy in the offseason,” Wyrick said. Goodner instantly started to prepare himself for the new position with film and formation review. The changes have helped Humboldt outscore opponents, 146-19, six points ahead of Chaparral for the classification best in the new-look Class 2A. The Cubs defeated Neodesha, 48-6, won at Fredonia, 42-7, and beaten Eureka, 56-6. Last season, Humboldt collectively scored 42 fewer points versus those three squads. “It was good to see it kind of come together maybe even a little quicker than we thought, I think that was kind of a worry for us,” Wyrick said. Last year marked Humboldt’s best season since an 8-3 mark in ’14. Class 2A’s top-five is heavily centralized. Silver Lake is in the east along with four western teams – Phillipsburg, Chaparral, Conway Springs and Garden Plain. The latter three are all in District 6. Humboldt, in District 1, has the possible opportunity for one of the deepest playoff runs in school history. However, the Cubs have a key District 1 opener at 2-1 Jayhawk-Linn this week. Jayhawk-Linn has defeated Humboldt in districts each of the last two seasons. The matchup will likely decide the district’s top-two slots and possibly the Tri-Valley League. Goodner has completed 20 of 28 passes for 339 yards with a 6/2 TD/INT ratio. He and junior Conor Haviland both have 25 carries. Haviland has recorded 345 yards and six scores, including a 95-yard run. Goodner is at 236 yards and five TDs. Allen, also one of the team captains, has eight offensive touches for 106 yards and a pair of scores and played well at cornerback. The offensive line has encountered changes. Junior Taylor Lassman was the starting right tackle last fall and has moved to center. The offense has averaged 12.1 yards per pass and 8.9 yards per rush. Senior Tucker Hurst, a starter since he was a freshman, has switched from tackle/guard to tight end. He has moved from defensive end after an all-state fall to defensive tackle. He has five TFLs to tie senior David Watts for the team-high. Watts has moved in at right guard after he served as a former backup. Senior Caleb Klauman is at left tackle, and junior Josh Hull starts at right tackle. Like Watts, Klauman and Hull have more past experience on defense. Humboldt is the heavy favorite in District 1. The Cubs have rolled to a 3-0 start will outscoring their opponents by an average score of 49 to 6. Dagen Goodner and Conor Haviland lead the Humboldt offense that averages more than 360 total yards per game. Jayhawk-Linn’s streak of consecutive Three Rivers League title took a blow with last week’s loss to Pleasanton. Still the Jayhawks have enough to reach the playoffs in this district. The remaining programs have struggled, but Southeast-Cherokee’s move to the Three Rivers League has already produced two wins and halted the Lancers’ 28-game losing streak. Erie’s lone win came 20-6 at Neodesha, while Riverton and Northeast-Arma are still searching for their first victory of the season. Riverton dropped a heart-breaker, 20-18, to rival Baxter Springs in Week 2, while Northeast has dropped 24 consecutive games. Third-ranked Silver Lake is the favorite to win this district. The Eagles enter district play posting win over quality opponents in Rossville and Riley County in consecutive weeks. The Eagles are long known for their offensive balance and strong defense, and are using that same formula this season. 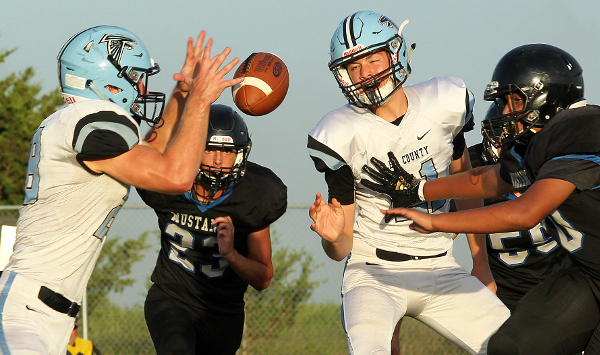 Mason Griffin has played well at quarterback (566 yards passing, 5 TDs), while Christian Stoner is averaging more than 120 yards per game on the ground. Osage City enjoyed a successful run to the state quarterfinals a year ago behind the solid play of all-state quarterback Tucker Kimball. Kimball has graduated, but the Indians are off to a 3-0 start behind Trenton Plinsky. Plinsky switched to quarterback from receiver, where he had more than 700 yards last season. So far, Plinsky has put up nearly 600 yards of total offense and 12 combined touchdowns. West Franklin looks to finally break into the playoffs this season behind 13 returning starters. The Falcons are off to a 2-1 start thanks to a ground game that averages more than 280 yards per game and features the three-headed attack of Clayton Noyons, Brayden Singer, and Shane Birzer. After struggling to a winless season a year ago, McLouth appears to be building momentum this season. The Bulldogs’ victory over Jefferson Co. North in Week 2 stopped a 12-game losing streak. Central Heights also stopped a long, 18-game losing streak with last week’s victory over Wabaunsee. Oskaloosa has struggled to an 0-3 start and has scored just six points through the first three weeks. Despite taking heavy losses to graduation, Nemaha Central received enough votes to begin the season in the top five. The Thunder have since dropped two games to quality opponents. Nemaha Central lost to second-ranked Sabetha in Week 1, before giving up a late score in last week’s 37-32 loss to Holton. Still the Thunder figure to be the favorite in District 3 with Maur Hill and Pleasant Ridge providing some challenge. Maur Hill features one of the state’s top small-school quarterbacks in junior Jack Caudle. The Ravens dropped their first game of the season last week when Caudle and the Raven offense were slowed in a 14-0 loss to unbeaten Jackson Heights. Pleasant Ridge is seeking a seventh consecutive playoff appearance, but the Rams haven’t won a playoff game since 2009. Atchison County’s switch to the Northeast Kansas League immediately resulted in the end to the Tigers’ 19-game losing streak. Since that Week 1 win over Oskaloosa, the Tigers have dropped consecutive games to Jackson Heights and Valley Heights. Meanwhile, Horton and Riverside have struggled to winless starts. Riverside surrendered a late score in last week’s 28-27 loss to Royal Valley, while Horton has scored only once this season. District 4 could be one of the more exciting races in Class 2A. The traditional strength of the Mid-East League makes Rossville and Riley County the favorites. Both the Bulldawgs and Falcons have played the same three teams. Both have a solid victory over a good 1A team in Centralia, both have defeated Rock Creek, and both have lost to Silver Lake. Rossville finished with just two wins a season ago, but returned as many as 17 starters with experience. The Bulldawgs have been led by senior Garrett Carver at quarterback. Carver has accounted for nearly 900 yards of total offense and nine touchdowns through three games. Meanwhile, Riley County is led by senior back Mikey Waggoner who is averaging more than 110 yards per game on the ground. Rossville travels to Riley County this week in a game that may decide the title. Mission Valley and Southeast of Saline are also unbeaten after three weeks. Mission Valley enjoyed a solid 2017 season under Jeff Savage before the veteran coach returned to the 8-Man ranks at Doniphan West. New coach Justin Duncan has led the Vikings to victories over West Franklin, Wabaunsee, and Northern Heights. Southeast of Saline has started unbeaten with wins over Sacred Heart, Beloit, and Russell. The Trojans offense has relied on sophomore quarterback Jaxson Gebhardt and his classmate Bryant Banks at running back. Council Grove has dropped games to quality opponents in Burlington and Osage City. The Braves have surrendered 100 points in the first three weeks of the season. Finally, St. Marys has lost to Silver Lake and Centralia, but handled Rock Creek, 32-9. The Bears have three backs over 100 yards on the season in Reese Hurla, Jonas Cruz, and Charles King. When analyzing the list of schools that make up District 5, the idea of them being on the West side is probably not the first thing that comes to anyone’s mind. Yet that’s where this group of schools predominately from southeast and south central Kansas is slotted in terms of the playoff picture. The district includes four members of the Tri-Valley League and two members of the Central Kansas League. Cherryvale, Douglass, and Fredonia all have won two of their first three games, while Belle Plaine and Eureka have one win each. Neodesha, despite returning as many as 9-10 players with starting experience, has struggled to an 0-3 start. In a district of several evenly matched teams, Douglass may get the slight advantage given their ability to score points and the leadership of four-year starter Zach Dressler. In addition, Douglass has four of the five district games at home. Eureka is playing all games on the road this season given the damage to their stadium from a tornado this summer. Cherryvale and Fredonia are also expected to challenge for the District 5 title. Cherryvale has won two straight since a season-opening loss to Caney Valley, while Fredonia has dropped a game to unbeaten Humboldt. Both the Chargers and Yellow Jackets have defeated Erie and Leon-Bluestem. Belle Plaine snapped a long Central Plains League losing streak with a 42-14 victory over Wichita Independent last week. The Dragons also have suffered a heart-breaking 37-36, overtime loss at Inman. Conway Springs, Chaparral and Garden Plain all had joined with Cheney in 3A, District 10 in previous years, annually one of the state’s toughest districts. Conway Springs needed to replace much of its offense but has started well with a 114-35 margin. Garden Plain has posted virtually the same margins at 102-26. Chaparral has tallied 140 points and received great news when all-state lineman Isaac Helms was cleared to play on Aug. 28. He has been in the last two contests. The Roadrunners’ offense has produced 451 yards a game, and senior quarterback Jake Burke has accounted for 14 scores. Trinity earned a quality 8-6 win versus Ell-Saline last Friday. Senior quarterback Kaleb Hammeke has delivered another big season with 560 total yards, five scores and an interception on defense. While the top-four teams are 3-0, Whitewater-Remington and Wichita Independent both stand at 0-3. Lakin is the only undefeated team in the district and is now 10-3 since the start of ’17 under coach Chris Bamberger. Before then, Bamberger has started his tenure 7-12. The Broncs have lost four in a row to Cimarron. Lakin features standout lineman Hadley Panzer and junior running back Kayden Christiansen (60 carries, 396 rushing yards, seven scores). Cimarron sophomore running back Tate Seabolt has stepped in well for his brother Josh in the Bluejay backfield. He has helped Cimarron average 348 rushing yards a game. Seabolt has 64 carries for 524 yards and five scores. Sterling has played a strong schedule against Ell-Saline, Marion and Sedgwick, teams that are a combined 6-3. Two of the contests came on the road. Sterling gets both Lyons and Southwestern Heights at home. Southwestern Heights has taken big losses Elkhart and Meade by an average margin of 30 points. Ellinwood has returned from eight-man football and posted consecutive wins at the 11-man level for the first time since the 2004 season. Phillipsburg is the front-runner in the district and, along with Conway Springs and Silver Lake, pace the classification. Four-year quarterback Trey Sides and running back Treylan Gross lead an experienced offense that has looked strong in 28-point wins versus Plainville and Smith Center. Kasen Keeten and Jaret Shelton are veteran, decorated linemen. Hoisington graduated all-state running back Sean Urban and lost quarterback Mason Haxton to injury but has averaged 340 rushing yards a game. Junior Wyatt Pedigo leads with 469 rushing yards, 24 tackles and three TFLs. Surprising Minneapolis is 2-1 after three wins in the last two years and has allowed 27 points a contest after 37 last year. For Norton, junior quarterback Kade Melvin has replaced North Carolina signee Jace Ruder under center. He has passed for 251 yards and rushed for 304 with all four of the team’s touchdowns. Ellsworth has to travel to Hoisington and Norton. TMP has produced just 20 points in three games under first-year coach David Bowen.